In the early days of the Web a need was recognized for a language to display 3D objects through a browser. An HTML-like language, VRML, was proposed in 1994 and became the standard for describing interactive 3D objects and worlds on the Web. 3D Web courses were started, several best-selling books were published, and VRML continues to be used today. However VRML, because it was based on HTML, is a stodgy language that is not easy to incorporate with other applications and has been difficult to add features to. Meanwhile, applications for interactive 3D graphics have been exploding in areas such as medicine, science, industry, and entertainment. There is a strong need for a set of modern Web-based technologies, applied within a standard extensible framework, to enable a new generation of modeling & simulation applications to emerge, develop, and interoperate. 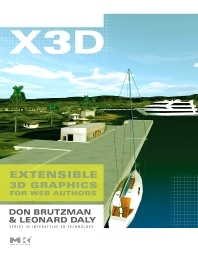 X3D is the next generation open standard for 3D on the web. It is the result of several years of development by the Web 3D Consortium's X3D Task Group. Instead of a large monolithic specification (like VRML), which requires full adoption for compliance, X3D is a component-based architecture that can support applications ranging from a simple non-interactive animation to the latest streaming or rendering applications. X3D replaces VRML, but also provides compatibility with existing VRML content and browsers. Don Brutzman organized the first symposium on VRML and is playing a similar role with X3D; he is a founding member of the consortium. Len Daly is a professional member of the consortium and both Len and Don have been involved with the development of the standard from the start. Digital media developers (including non programmers), Web authors & developers, digital artists, and students in undergraduate courses on virtual worlds, interactive 3D programming, introductory computer graphics, etc. Don Brutzman is a computer scientist and associate professor working in the Modeling Virtual Environments & Simulation (MOVES) Institute and Undersea Warfare Center at the Naval Postgraduate School. A former submarine officer, his research interests include underwater robotics, real-time 3D computer graphics, artificial intelligence, and high-performance networking. He is a board member of non-profit Sea Lab Monterey Bay, which is designing and building a youth-oriented year-round residential science camp. He is a founding member of the non-profit Web3D Consortium Board of Directors. Currently he leads the Extensible 3D (X3D) Working Group for the ISO X3D/VRML Specification, and directs development of the Extensible Modeling and Simulation Framework (XMSF). Leonard Daly is president of Daly Realism, Inc., technical editor for e3D News, and treasurer of the Web3D Consortium. He has over 20 years of experience focusing on information visualization in a variety of industries including astronautics, oceanography, health care, and supply chain management. He has developed and supported numerous 3D projects in a variety of disciplines including astronautics, education, and multi-dimensional signal processing. He was a founding member and treasurer of the Los Angeles VRML User’s Group. His current work in X3D includes specification development, teaching, book authoring, and problem solving. He has organized and led the presentation of multiple courses on various topics in X3D at SIGGRAPH in 2002 and 2003 and the Web3D Symposium in 2000, 2002, and 2004. Daly Realism, Valley Glen, California, U.S.A.